Hot Springs National Park is adjacent to the city of Hot Springs, Arkansas. It gets its name from the hot spring water that flows down the western side an eponymous mountain. At just more than 5,500 acres, it is the smallest national park by area, but it receives 1.3 million visitors a year. The park may be small, but there are plenty of activities to keep visitors busy. Visitors can take a stroll down Bathhouse Row or Grand Promenade to view the elegant bathhouses of a bygone era. Guided tours are also available. Visitors can visit the restored Fordyce Bathhouse, which in its heyday included elaborate baths, a music room, and even a bowling alley. The bathhouse was in operation from 1915 to 1962. After it closed, it remained vacant until 1989 when it was reopened as the park’s visitor center and museum. At the Buckstaff Baths, visitors can take a traditional bath the way it was more than half a century ago. For a modern spa experience, try the Quapaw Baths and Spa. If visitors have more time or are looking for a more vigorous activity, the park offers 26 miles of hiking trails to explore. Hot Springs Mountain Trail begins at the Pagoda shelter below the Hot Springs Moutain Tower, and takes visitors through hardwood and pine forests up the western side of the mountain. The longest train in the park, Sunset Trail, leads visitors through 10 miles of varied terrain. The trail traverses West Mountain, allows for breathtaking views of Sugar Mountain, and brings visitors through what was once the Fordyce family estate. The park is open all year round, and the visitor center in the Fordyce Bathhouse is open daily from 9 a.m. to 5 p.m., except New Year’s Day, Thanksgiving Day, and Christmas Day. The camp offers both primitive and RV hook-up campsites. Primitive sites are $10 per night, while full hook-up sites are $24 per night. Campgrounds do not take reservations. Located in an urban area, the park surrounds the north end of the city of Hot Springs, Ark. Visitors should be wary of businesses who advertise that they are in Hot Springs National Park, when they actually are not. It is good to know that the city of Hot Springs also goes by Hot Springs National Park. And go ahead, “Quaff the elixir.” It’s encouraged to drink the water. Since the park is mainly urban, the wildlife in the park is typical of the region. There are no threatened or endangered species in the park. Birds, rodents and bats are plentiful. Native Americans called it the “valley of the vapors.” For more than 8,000 years, native peoples of many tribes would gather at the springs, setting aside their differences to relax and partake in the healing properties of the thermal waters. Spanish and French settlers knew about area, but it wasn’t explored by the United States until after the Louisiana Purchase in 1803. Americans quickly understood that the area was a special place. It was believed that the springs could cure diseases of the skin and blood, rheumatism, nervous afflictions and other sicknesses. Patients and physicians rushed to the area, and bathhouses and cottages were built quickly to accommodate them. For fear the springs were getting polluted, the government set aside the area as a federal reserve in 1877, which forbade private control over any of the hot springs area. Now a federally owned reserve, the springs were transformed into a protected “spa city.” Tourists came from all over to experience the transformative benefits of the springs. Roads were improved, and brick and stucco bath houses were constructed. They even featured amenities like billiards rooms and other entertainment. The springs were walled up and covered for protection. The reserve was officially designated Hot Springs National Park in 1921. March, 1921 – Hot Springs National Reserve re-established as Hot Springs National Park. May, 1933 – Civilian Conservation Corp camp founded at Hot Springs National Park. The corps would build walls, dig swimming pools and make other improvements to park facilities. 1962 – The Fordyce Bathhouse closes due to a decline in visitors. 1972 – The park acquires 1,314 acres. 1973 – An additional 883 acres are added. 1982 – Fordyce Bathouse is restored and reopened as the park’s visitor center. 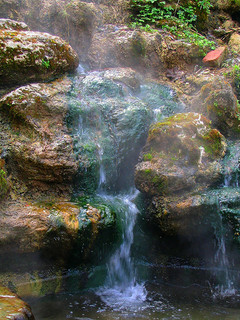 Click to see a detailed Hot Springs National Park map.